Wild Dingo Press is a small indie publisher that punches well above its weight. I read their The Rugmaker of Mazar-e-Sharif by Najaf Mazari not long before I started this blog, but in those days I didn’t take much notice of publishing details and didn’t realise that Wild Dingo Press is located just around the corner from my place, in my local shopping centre! Wild Dingo Press … brings to light the stories of individuals quietly doing extraordinary things, be it exposure of corruption and systemic flaws or the experiences of the disenfranchised, disempowered and dispossessed. Shedding light on social issues and sharing the rich cultural output and traditions of those oft-discussed but denied a voice, Wild Dingo Press publishes memoir, narrative non-fiction and investigative journalistic non-fiction that challenge readers and enrich them personally, intellectually and emotionally. Well, in view of the Syrian refugee crisis in Europe, it contributes to a feeling of optimism about the situation, to be reading a memoir of refugees who overcame adversity to rebuild their lives in the country that gave them a new home. 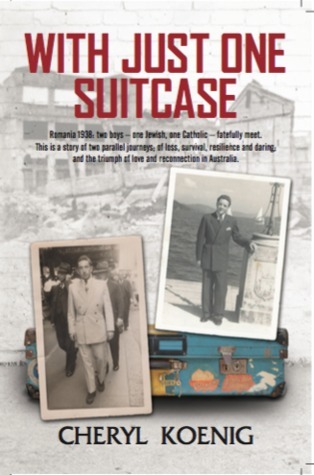 With Just One Suitcase is the remarkable story of two boys who had a fleeting acquaintance in Romania in 1938, endured all kinds of travails under Nazi Germany and Stalinist Romania, came separately to Australia in the post-war mass immigration era, and met again when their children fell in love and married! The story begins with their parents, who despite differences of religion and social class had a customer/client relationship and respected each other. The boys grew up in the small town of Timisoara, but the innocence and stability of their childhood was shattered by WW2 and the shifting alliance between Germany and Russia. Frici’s (Fred) Löw’s family is Jewish, and though they survived the war by hiding out on a farm and bribing local police, they lost almost all of his mother’s family in Auschwitz. When the Russians arrived they commandeered what was left of the family business and took over their house. But plans to escape faltered when the people smugglers were caught and shot, and only Frici and his brother got across the border to Hungary, and eventually to freedom in Sydney. Istvan (Steven) Koenig’s Hungarian ancestry brought him into conflict with the Russians when they joined the allies. Anyone of German or Hungarian descent was deemed to be hostile to the new regime, and he spent years of his young life in Soviet labour camps. Despite the appalling conditions, he was determined to survive, and made himself indispensable to the authorities by becoming an interpreter, eventually making a successful escape after many attempts. He made his way to Sydney too, and became one of many who made a successful life in our country. While I wasn’t always entirely comfortable with the fictionalised conversations that fill the gaps in the narrative, I did like the emphasis on the contrasting personalities of these young men. Although the author is the daughter of Frici, she is upfront about some of his character flaws: the pugnacious risk-taking that served him well in surviving the war and its horrors predisposed him to gambling, and that caused friction in the home. Istvan, on the other hand, is stubborn and competitive, with an obsession for soccer that took precedence over school work. That stubborn determination ended up landing him in the most severe labour camps because he kept trying to escape. Yes, it’s a beaut Aussie name, for a publisher committed to spruiking distinctive Aussie voices!